As a Republican candidate, he ran unopposed in the 2011 election. His campaign messaging included using DNA to solve crimes and creating an inmate labor force. Harding was born and raised in Fork Union, Virginia in Fluvanna County. He graduated from Virginia Commonwealth University in 1973 with a degree in Social Welfare and worked as a probation counselor with Virginia's juvenile court system. 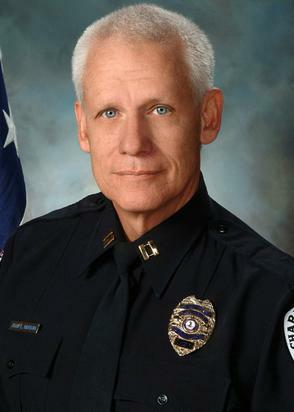 In 1978, he became an officer with the Charlottesville Police Department. In 1989, Sergeant Harding was the first local officer ever selected to supervise a Federal Drug Task Force. Harding lives with his wife, Linda, in the Ashcroft subdivision on Pantops Mountain. ↑ 1.0 1.1 Web. Leaving a legacy: Albemarle Sheriff Harding to retire in ‘19 after nearly 50 years in law enforcement, Allison Wrabel, Daily Progress, World Media Enterprises, retrieved January 14, 2019. ↑ Web. Sheriff Harding to seek re-election, Sharon C. Fitzgerald, Daily Progress, World Media Enterprises, 22 March 2011, retrieved 8 August 2012. ↑ Web. Who is Chip Harding?, Albemarle County Sheriff's Office, retrieved 8 August 2012. ↑ 6.0 6.1 Web. Harding To Run One Last Time For Office, Stephon Dingle, Charlottesville Newsplex, January 10, 2015, retrieved January 12, 2015.